Junior Taylor Cowley has been named Offensive Player of the Week for his Week 8 performance against the Marion County Warriors. Cowley had a breakout game with a 37-yard touchdown reception from QB Zack Pemberton to help the Eagles go on to a 27-14 win over visiting Marion County. Taylor also graded out at 85% to keep the Pemberton’s Triple Eagle Option rolling. Cowley and the Eagles take to the road this Friday for region rivalry game with neighboring Soddy Daisy. 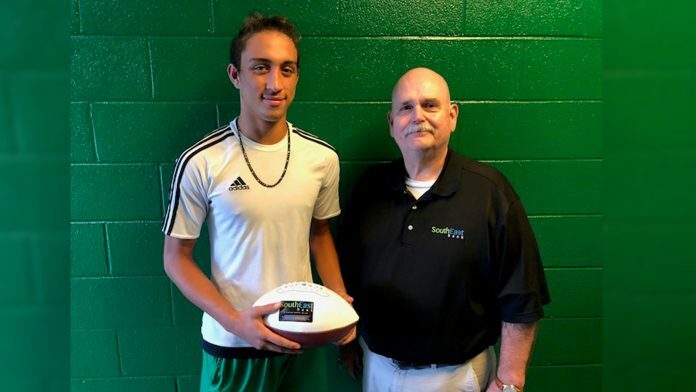 The Offensive Player of the Week Award is presented by SouthEast Bank.